What is a Coffee Plant Varietal? What are the major Coffee Plant Varietals? What are other terms that refer to Coffee Plant Varietals? What determines if a coffee plant is a varietal? What are the characteristics that differentiate coffee plant varietals? Do Coffee Plant Varietals reflect the region in which they are grown? 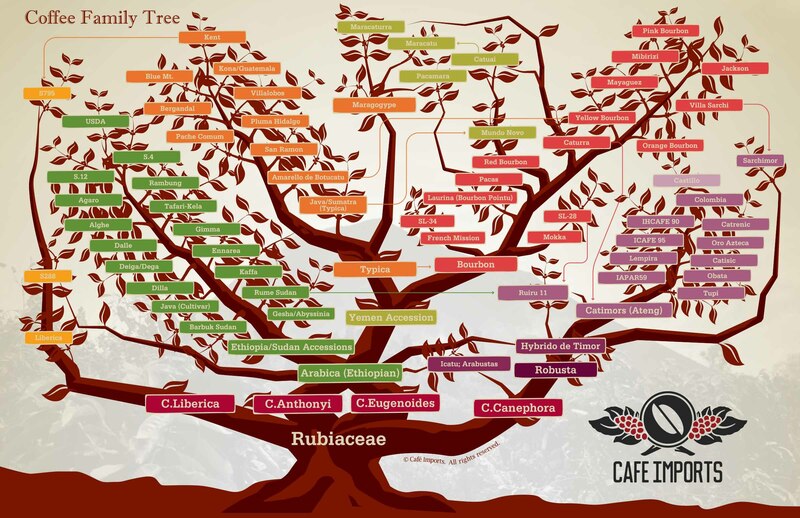 What are the original Coffee Plant Varietals? Why are new Coffee Plant Varietals developed? A coffee varietal (or variety) is a fancy way of saying “type” of coffee. Just like there are different “types” of apple plants (granny smith, royal gala, macintosh) and “types” of tomato plants (roma, plum tomato, cherry tomato, beefsteak tomato), there are “types” of coffee plants. Nerdy definition: A botanical term describing forms and selections of coffee plant varieties that are derived either through natural selection or through selective breeding (for specific genetic traits) resulting in distinct genetic subspecies of the main coffee species (e.g., Arabica, Canephora, Excelsa and Liberica). Amarello, Arabusta (interspecific hybrid), Arusha, Bergendal, Blue Mountain, Bourbon, Catimor, Caturra, Catuai, Charrieriana, Colombian, Ethiopian Harrar, Ethiopian Sidamo, Ethiopian Yirgacheffe, French Mission Bourbon, Hawaiian Kona, Java, K7, Kent, Maragogype, Marigojipe, Mayaguez, Mocha, Mundo Novo (hybrid), Pacamara (hybrid), Pacas, Pache Comum, Pache Colis (hybrid), Panama, Ruiri 11 (dwarf hybrid), San Ramon, Santos, Sarchimor, Sidikalang, SL28, SL34, Sumatra Mandheling, Sumatra Lintong, Sulawesi Toraja Kalossi, Timor (interspecific hybrid), Typica, and Uganda. Icatu hybrids are created through repeated backcrossing of hybrids of Coffea arabica and Coffea canephora var. robusta with the coffee plant cultivars Caturra (Coffea arabica var. caturra) and Mundo Novo (Coffea arabica var. mundo novo). Also see Varietal Distinction; Selective Breeding. Hybrid is distinct in that it refers to a cross between two genetically dissimilar cultivars. Hybrids are typically made to influence taste and/or disease resistance. One test of whether a particular plant is indeed a cultivar/varietal is if the plant variety can be reliably propagated. Different varieties (cultivars; varietals; hybrids) have distinct flavors, body (mouthfeel), and other basic coffee characteristics (e.g., acidity, bitterness/sweetness, and finish/aftertaste) as well as differing amounts of caffeine. Distinct variations in cultivars likely reflect the particular region where the coffee was grown, including its soil, climate, and other regional factors (e.g. average amount of sunlight; altitude, etc. ), and also how the coffee was harvested and processed, producing distinctive characteristics (e.g., the winey acidity of a Kenyan coffee, the full-bodied resonance of a Sumatra Coffee. A consumer purchasing a coffee varietal will expect a single-origin coffee, pure and unblended, and typically labeled with the name of the country or growing region of origin, and possibly also the particular estate where the coffee was grown (e.g., Jamaica Blue Mountain: Jamaica is the country, and the Blue Mountains are the geographical location; Blue Mountain is also the name of the coffee plant varietal (Coffea arabica var. blue mountain). The first Coffea arabica varietals are thought to be Coffea arabica var. arabica and Coffea Arabica var. bourbon. Bourbon is named after the region where it was first cultivated. Virtually all other varietals are thought to have originated from these two varietals, including the popular Arabica variety called Typica (Coffea arabica var. typica), which is derived from Coffea arabica var. arabica. Many varietals are chosen for cultivation based not necessarily on their flavor or aromatic qualities, but more so for their resistance to diseases and the ease with which they may be grown. These new varietals are known as “cultivars” – coffee strains that are specifically developed instead of naturally derived. This includes coffee plants and coffee cherry, and full descriptions of all of the world’s top gourmet coffee beans including Organic Coffee, Fair Trade Coffee, Bird Friendly Coffee, Strictly High Grown and Shade-Grown Coffee. Check out the most comprehensive Coffee and Espresso Glossary ever written, and also the World’s Best History of Coffee. More than just information about the different types of coffee plants, we also included full details about Coffee Makers (Automatic Drip Coffee Makers, Single Serve Coffee Makers, Pod Coffee Makers, Coffee Pods, Coffee K-Cups, T-Discs, and French Press, (also see Best Coffee Makers), and Espresso Machines (including Pod Espresso Machines) as well as Instant Coffee and Decaffeinated Coffee. give me the best variety of fertilizer used in top dressing k7 coffee.